PORT TOWNSEND — An 80-foot schooner was back afloat Monday thanks to volunteers and students from Salish Rescue after a hard grounding at the beach near the Point Wilson Lighthouse. The schooner Nina Otaki was freed Tuesday, Sept. 19 by the work of adult volunteers and local high school students trained by Salish Rescue, a local nonprofit that provides maritime safety training and small-boat rescues. “It was really a great engineering effort by our crew,” Erik Wennstrom said Monday. He is a Salish Rescue instructor and helped with freeing the schooner. The 63-ton schooner, made of iron-reinforced concrete, was anchored off the beach near the Port Townsend Marine Science Center and was pushed ashore by high winds Sunday, Sept. 17, according to a press release issued this past Sunday night by Salish Rescue. On Sept. 17, several pleasure boats in the area attempted to help pull the schooner from the beach, but at least one boat suffered damage to its deck while trying to pull the boat free, according to Salish Rescue. The state Department of Natural Resources, Coast Guard and local fire and law enforcement officials didn’t have anything readily available to pull the boat free, so students from Salish Rescue decided to give it a try, according to Wennstrom. Salish Rescue crews attempted to help Sept. 17, but their small inflatable boats weren’t able to help. 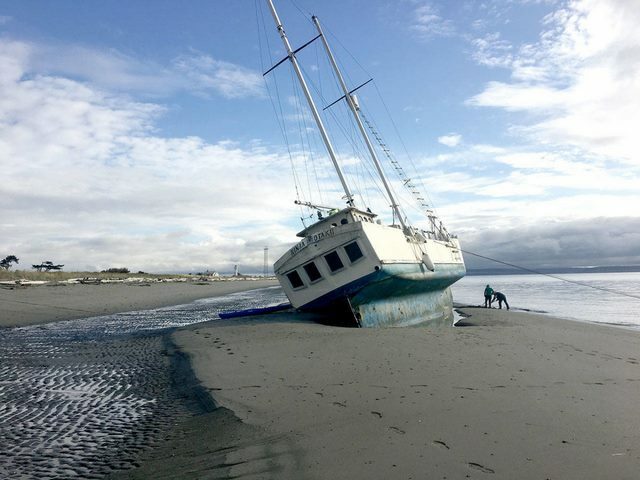 The schooner was left until the morning of Sept. 18 and was pushed further ashore during one of the highest tides of the month. When the tide came out, the schooner was left high and dry on the beach. Salish Rescue crews put out a call on Facebook for people to meet at the beach Sept. 18 with shovels, and a group began digging to free the keel of the schooner. “We gained a lot of ground that way,” Wennstrom said. Crews also set up a system of winches and anchors in order to supply the 18,000 pounds of pull needed to move the schooner closer to deep water. The final pull was on the afternoon of Sept. 19, during the highest tide that would be seen in that area for the rest of the month. According to the Salish Rescue press release, crews were able to nose the schooner a little farther out to sea, and then the schooner suddenly floated. The Nina Otaki was able to motor away from the beach under her own power at roughly 4:30 p.m., just after high tide Sept. 19. The schooner is owned locally, according to Wennstrom, but he didn’t know where the schooner would be headed to next. Wennstrom said this was quite the accomplishment for his team of volunteers since he didn’t think they’d be able to free the vessel, but that trying would be good training. Salish Rescue operates two small rescue boats, one out of Point Hudson and another on the weekends at the Port Townsend Marine Science Center to help keep an eye on kayakers. Salish Rescue has been providing training and rescue operations for Port Townsend since 2004.